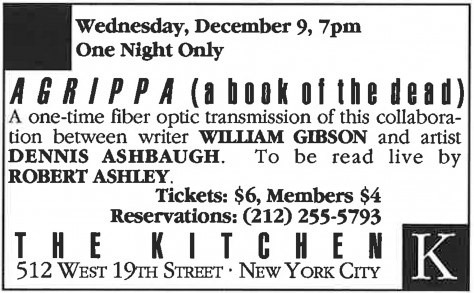 On December 9, 1992 The Kitchen premiered Agrippa (the book of the dead) with a one-time performance known as “The Transmission.” Agrippa is a multimedia work of art that was a collaboration between author William Gibson and artist Dennis Ashbaugh. The work has several components, including a tattered looking artist’s book by Ashbaugh in which a 300-line poem by Gibson is inscribed, which was published in limited edition in 1992. Once the books were exposed to the air the poem would slowly fade because of photosensitive chemicals applied to the editions. The performance at The Kitchen was an incomplete reading by musician Robert Ashley, which was simultaneously transmitted to several other sites across the country. Agrippa was influential for several reasons; it challenged the idea that art objects are necessarily permanent and meant to be preserved, while also expanding the use of electronic media.